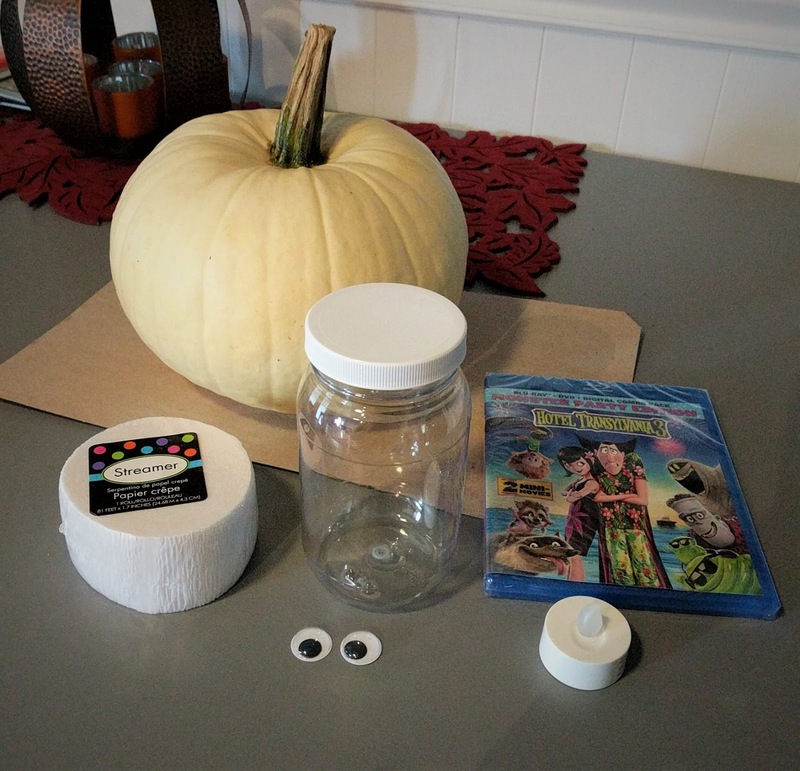 The Drac Pack is back with HOTEL TRANSYLVANIA 3, just in time to for a spooky, fun, family movie night right before Halloween! This must-own family comedy, which has grossed more than $425 million in theaters worldwide to date, follows in the tradition of the blockbuster Hotel Transylvania franchise when Mavis surprises Dracula with a family voyage on a luxury, haunted monster cruise ship. Of course, the rest of the Drac Pack has to tag along, and that’s when things get a little…batty. The monsters are having a great time, indulging in all of the shipboard fun the cruise has to offer, from monster volleyball to colossus-sized buffets and exotic excursions, but then the unexpected happens when Drac falls for the ship’s mysterious (and dangerous) human captain Ericka. The third film in this family-friendly monster franchise is the best reviewed installment and you’re invited along on the haunted cruise vacation! 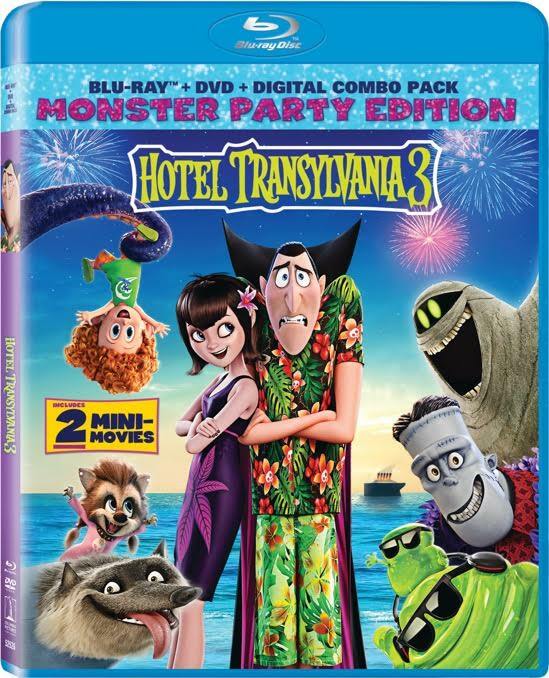 HOTEL TRANSYLVANIA 3 is out now on Digital HD and on Blu-ray™ Combo Pack and DVD on October 9. The all-star voice cast is back, along with some new faces as well including Adam Sandler (Grown-Ups), Andy Samberg (TV’s “Brooklyn Nine-Nine”), Selena Gomez (Spring Breakers), Kevin James (Paul Blart: Mall Cop 2), David Spade (TV’s “Rules of Engagement”), Steve Buscemi (TV’s “Boardwalk Empire”), Keegan Michael Key (TV’s “Key and Peele”), Molly Shannon (TV’s “Saturday Night Live”), Fran Drescher (TV’s “The Nanny”), Kathryn Hahn (Bad Moms), Jim Gaffigan (Super Troopers 2) and Mel Brooks (Young Frankenstein). 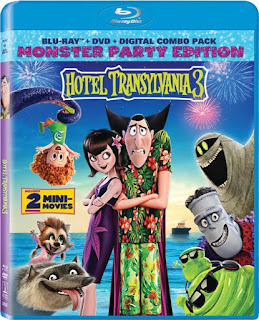 HOTEL TRANSYLVANIA 3 is filled with more than an hour of engaging bonus materials including three “All-New Scary-Oke Sing Alongs,” a monster dance party dance along to “I See Love” by Joe Jonas featuring Jonas Blue, plus a fun zing-tastic read along with Drac. Families can enjoy all the frightful fun with a “Plan Your Own Spook-tacular Sleepover” feature and “Vampire Make Over: Mavis and Drac Tutorial,” and go behind-the-scenes to explore the amazing talent who bring these characters to life in “Behind the Screams – The Voices of Hotel Transylvania 3. HOTEL TRANSYLVANIA 3 is directed by three-time Emmy®-winning director Genndy Tartakovsky and written by Genndy Tartakovsky and Michael McCullers. The film is produced by Michelle Murdocca. Hotel Transylvania 3 is presented by Sony Pictures Animation. 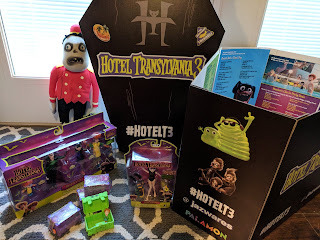 Recently I received a super cool box of fun Hotel Transylvania 3 items inspired by the movie. Along with it came some super cool craft ideals as well! 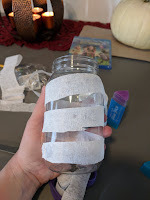 Check out these easy crafts below! 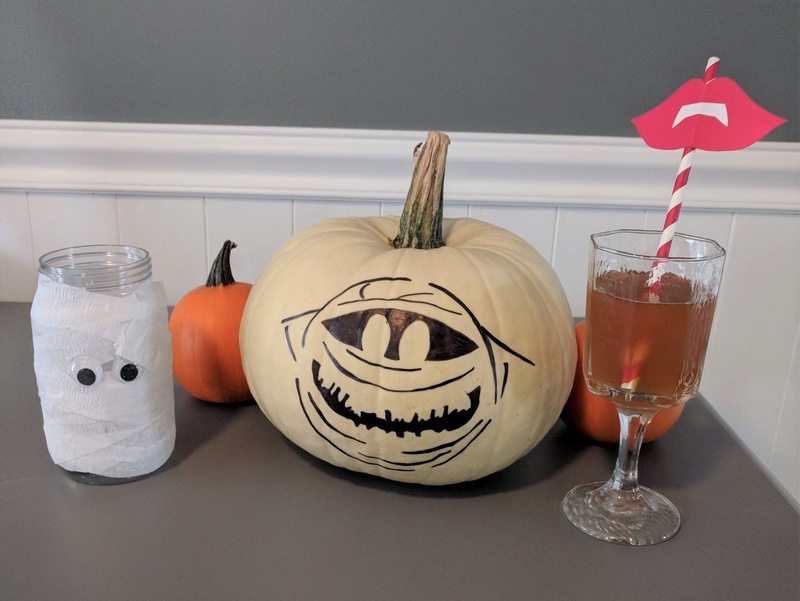 Instead of carving pumpkins this year, you can create cool pumpkins that are mess-free! 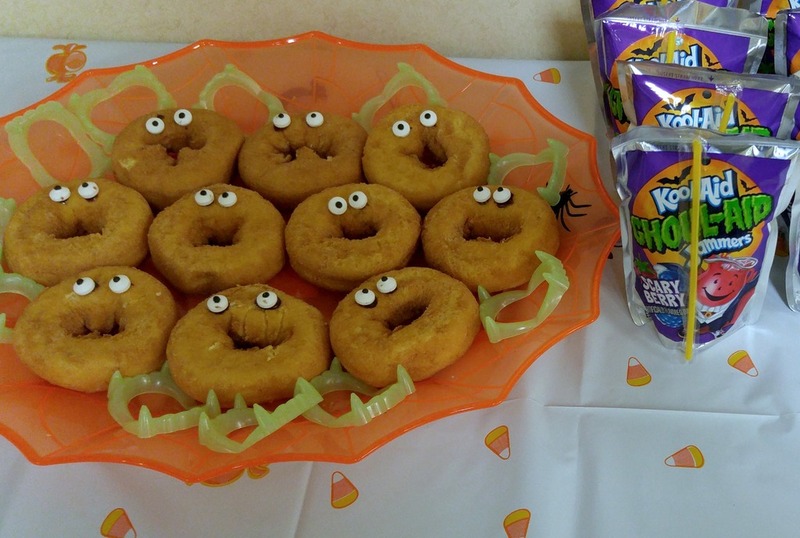 Head on over here to access the Hotel Transylvania pumpkin carvings to get some ideas! You can easily draw on the pumpkins in pencil first to get your base shape on it. If you are not artistic, you can find an image online. Cut out the design and then on the back of the paper, using a pencil, color the line area dark. This will make it like carbon paper! Tape the design to your pumpkin and trace out the design with a sharp pencil. 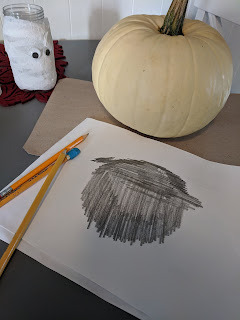 This will make your faux carbon paper transfer the design to your pumpkin. 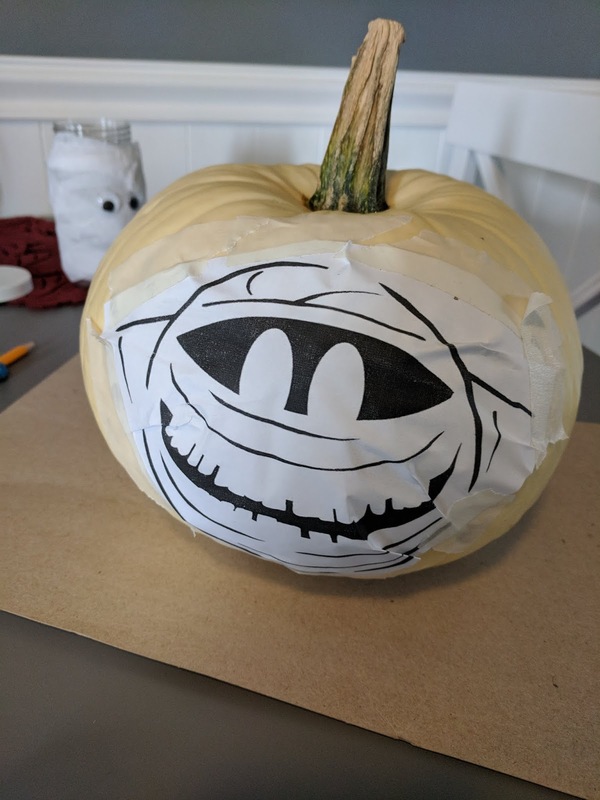 With the Sharpie in hand added all the unique details and designs to the pumpkin! The possibilities are endless! 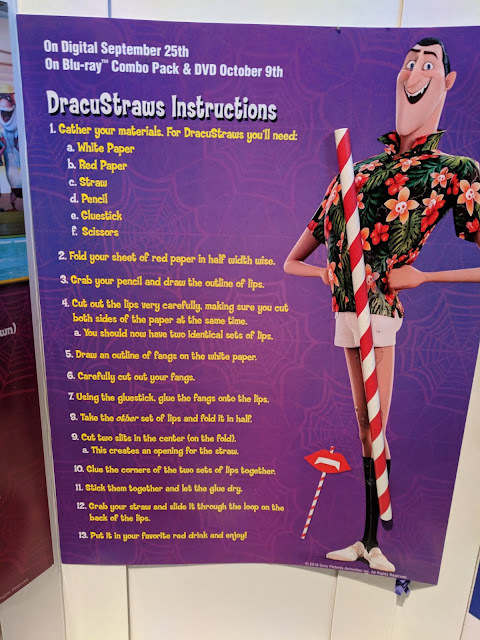 Follow these fun instructions above to make a "Dracustraw"! You can see mine with my Murray pumpkin above! 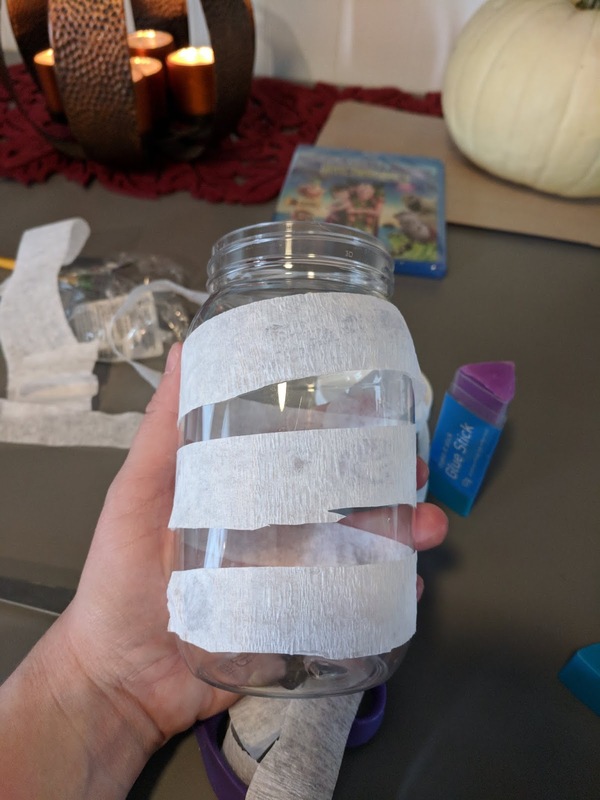 Take old canning jars and use the glue/modge podge to secure the gauze/streamers to the jar. Make sure you slightly overlap each layer and then when its looks like the perfect mummy, add some glue to the back of the googly eyes and adhere them to the mummy. 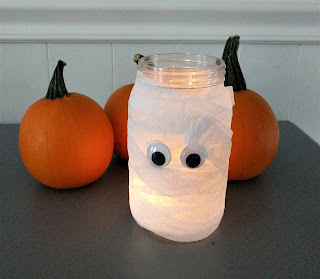 Next add your tea lights or battery LED ones to get Murray to glow! 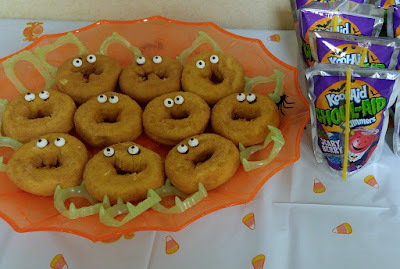 Are you looking for a fun treat idea to bring to your kids school for their Halloween party? 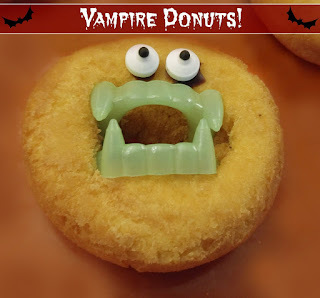 These are super easy to make, yummy to eat and when you are done, you have some super cool Vampire teeth to sport! Squeeze a set of vampire teeth and place in the hole of the donut (depending on the size of the hole of the donut, you may need to cut the hole out a little bit). Here is a tip...if you are struggling to get the teeth in the hole, use a small rubber band to make the teeth tighter and easier to fit! 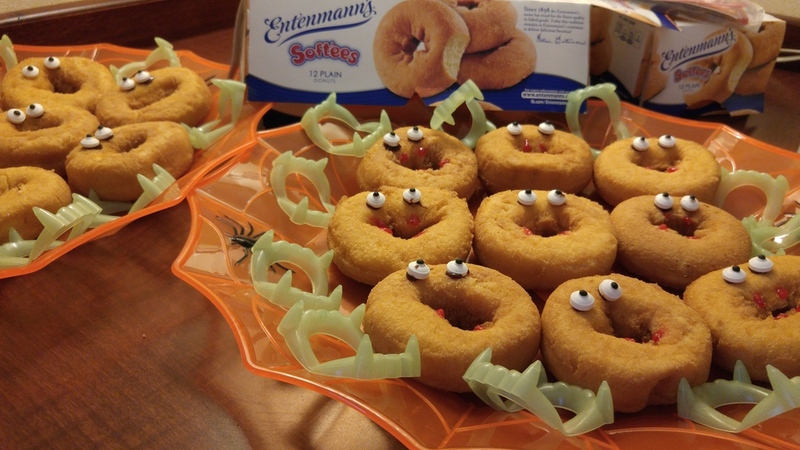 Place some frosting on the back of the eyes and secure them to the donut. If you have red frosting, you can also use that for the added blood effect. Don't want to go with the Vampire teeth aspect? Then still adhere the candy eyes to the donut and have an instant monster staring back at you! 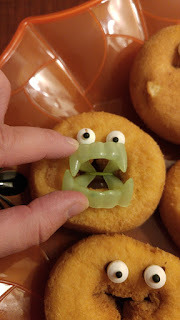 Struggling to get the teeth in place, no worries, use the red frosting to make your own blood drips and just serve donuts with the teeth on the side! HOTEL TRANSYLVANIA 3 has a run time of approximately 97 minutes and is rated PG for some action and rude humor. In addition to the movie, I received selected toys inspired by the movie from Jazwares, an award-winning toy company that created a whole new series of toys based on the HOTEL TRANSYLVANIA characters. These toys are amazing – and will have your kids completely entertained so you can get ready for your family movie night in! 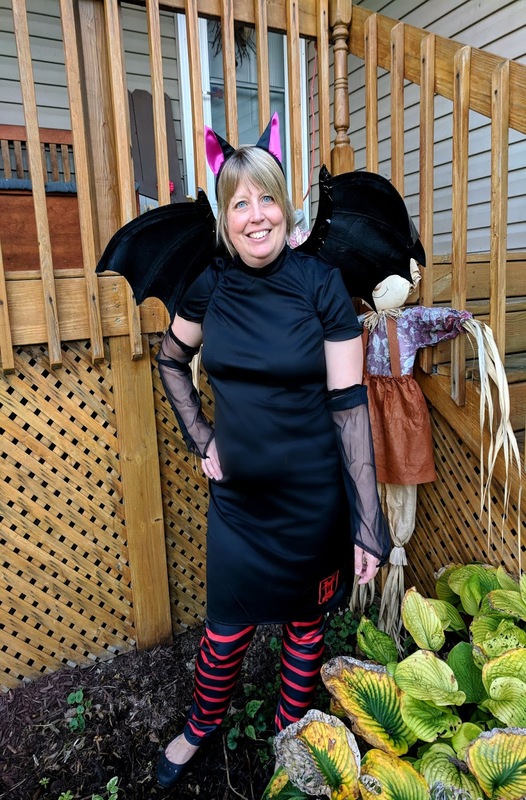 I also received my own Mavis Halloween Costume! 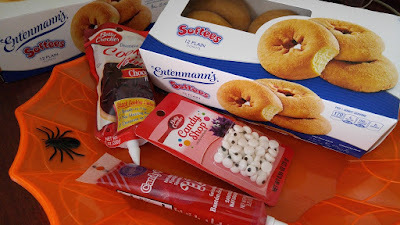 Now I am ready for Trick or Treat with the kids! We have been taking the kids to see this series since the first one came out. This series just keeps staying great! Our family loves each one. Each movie has such a wonderful story line and laugh out loud funny. These are movies that you know contain clean fun and safe for the entire family! Sony Pictures Home Entertainment (SPHE) is a Sony Pictures Entertainment (SPE) company. SPE is a subsidiary of Sony Entertainment Inc., which is a subsidiary of Tokyo-based Sony Corporation. SPE's global operations encompass motion picture production, acquisition, and distribution; television production, acquisition, and distribution; television networks; digital content creation and distribution; operation of studio facilities; and development of new entertainment products, services and technologies. SPE’s Motion Picture Group includes film labels Columbia Pictures, Screen Gems, TriStar Pictures, Sony Pictures Animation, and Sony Pictures Classics. For additional information, visit http://www.sonypictures.com/. Sony Pictures Animation produces a variety of animated and family entertainment for audiences around the world, including comedy hit franchises such as The Smurfs, Cloudy with a Chance of Meatballs, and Hotel Transylvania. Next for the division are Genndy Tartakovsky’s Hotel Transylvania 3: Summer Vacation, in theaters now; the groundbreaking animated feature Spider-Man: Into the Spider-Verse from the minds of Phil Lord and Christopher Miller in December 2018; the original feature comedy The Mitchells Vs. The Machines in January 2020; and the animated musical Vivo, featuring original songs by Lin-Manuel Miranda, in November 2020. Sony Pictures Animation, which was founded in 2002, is a division of the Sony Pictures Motion Pictures Group. Disclosure of Material Connection: I recieved the above mentioned item for mentioning this movie release on my blog. Regardless, I only recommend products or services I use personally and believe will be good for my readers. I am disclosing this in accordance with the Federal Trade Commission’s 16 CFR, Part 255: “Guides Concerning the Use of Endorsements and Testimonials in Advertising.